Has Marriott always been this virulently anti-guest? When Bill Marriott was in charge, the emphasis was on the customer. Things started to go downhill in 2009 when Arne was promoted to President and COO. Bill Marriott's team enforced contracts with franchisees with an iron fist, almost always ruling in favor of the customer. Things are different under Arne's team. I agree. In the "good old days" the lounges were open on weekends, upgrades usually worked as indicated, there were no mandatory, rip-off, resort or property fees, customer service calls were answered promptly, platinum welcome gifts included a bottle of wine, if desired, etc. The culture is much changed with brand inconsistency, hotel inconsistency, and poor customer service too often. After 1500 plus nights with Marriott, I see Marriott as simply another opportunistic business where customer service cutbacks are the perceived way of maximizing profits. I was only SPG Platinum for about 4 years. Those were some truly fantastic experiences - upgrades that mattered (full suites) and nearly always solid on-property recognition of the status, even in cases when a full suite was not available. I've been Marriott Platinum for many years and am now Lifetime "Titanium" (lol). For most of that time, Plat was alright: customer service was good, the phone support was quick and competent, and I have enjoyed many Travel Packages to many different parts of the world. I generally accepted the fact that most Marriotts weren't built with many suites, so I never obsessed about upgrades. Platinum meant they never failed to get your bed/smoke right and almost always gave you the best non-suite room they had. In cases where I stayed at a hotel with lots of suites, or lots of junior suites, I got some upgrades. Marriott always felt a little more transactional vs. Starwood's aspirational, but both had their place and Marriott's people and culture always seemed competent and professional to me. Then came 2018. Now it seems that the entire thing has fallen apart and they can't get the basic things right. Answering the phone, maintaining a working website, operating a loyalty program, and generally acting like they don't care about their customers. At what point do people get fired? At what point does the Chairman of the Board stand up and say "We made a huge mistake and we're going to try to fix it." This feels like Marriott's New Coke moment. Except for instead of just a bad product, it's a bad product that doesn't work and doesn't appear to have been tested at all. tfong007, KRSW, andrewstahl and 2 others like this. As one with over 1,500 nights, I speak from experience. Chances are you only stayed at SPG as a non-elite, or after the merger, when it was no longer SPG in any way shape or form. The reality is that individual legacy Marriott and Starwood properties have hotel GM who largely control our experiences at the property level and make the decisions on whether to do the bare minimum, cheat on award or suite availability, or focus on delivering excellent guest experiences. They are usually operated by a hotel management company that also controls those decisions. Some of those GM's are excellent! I have handwritten notes and cell phone numbers from many GM's at Marriott properties around the world. I've never received a note at a legacy SPG property. But hotel experiences can vary. For example, I like the SLS in LA and am a repeat guest. But, last time I was there, they wanted $200 for a suite upgrade to a basic suite that should have been free because they had adopted the legacy SPG "standard" suite approach. In contrast, since then, my last couple of stays, I've stayed at the Marriott BH, where they upgrade me to a larger suite than the one the SLS wanted $200 for. Breakfasts at W's in the US alone are all over the place. And, of course, the phone lines were overwhelmed last year between the 8/18 merger and the state actor data theft. It was compounded by poor planning and poor communication. Moreover, its my sense that Arne, like other executives in the travel industry, might pay more attention to what he views as blogger schemes (lets change hotels 5 times to get 5 arrival bonuses) that bloggers identifying issues (hotels that don't comply with the spirit of the program on upgrades, award availability, or breakfast) . Plus, this focus on "moments" is stupid (although it comes from legacy SPG folks) and they need to focus on delivering their core business right before moving on to incremental revenue from selling hop on/hop off tickets. Is this a SPG/Marriott thing? Or is it a difference in approach by an individual GM? Personally, I think we need to get beyond the merger issue and focus on helping keep us aware of which properties exceed, which properties cheat, and which properties follow the St.R Aspen approach of taking advantage of guests. Flying for Fun likes this. Just asking, because for 20 years we focused our hotel budget almost exclusively to SPG properties. Reason was, as Lifetime Platinum members, we received world-class service in terms of recognition and benefits. Upgrades, sometimes they were pre-allocated. If not pre-allocated, they were warmly offered at check-in. Now as Titanium for life, it's like, "where's the upgrade?" better rooms available for sale only. In terms of Breakfast, this was a most wonderful benefit at SPG's leading locations. Now, it's like "no breakfast for you, our lounge is closed and we don't offer breakfast when the lounge is closed", or if there is breakfast, the offering seems to be low quality. With SPG, there was a warm heart, and they cared, and they showed it. Now, with Marriott, there's a big fat finger telling us we just don't care about you. With SPG, you'd actually receive a nice and thoughtful local gift on arrival some times. With Marriott, that nicely wrapped red gift on the bed in the Bonvoy commercial seems to be your virtual welcome gift. So Arne and friends, guess what, there are tons of options around the world nowadays that don't have the Marriott brand nameplates, that do have a heart and show they care, with warmth and world class hospitality. Bonvoyage. As for legacy SPG properties, breakfast is always offered but can be radically inconsistent, even at the hotel. At one W, its a select list of 2-3 viable options. At another W, its a $25 credit toward anything on the menu. At another W, its three breads (muffin/crescent/pastry), coffee and juice. At one Westin I've stay at, some days, its anything I want on the menu within reason and other days, its a choice of oatmeal or fruit and yoghurt, with juice and coffee. Agreed; picking breakfast as an example in a SPG-vs-Marriott complaint is bizarre to me. SPG was late to offer PLT breakfasts, and has always trailed Hyatt and Hilton in implementation, IMHO. Which isn't to say Marriott hasn't made it worse -- I don't even *understand* the new Marriott breakfast rules without a cheat sheet -- but it certainly wasn't a highlight of the SPG program for "20 years." I was SPG plat before with occasional marriott stays - it was always a good experience; even without any MR status phone CSRs were consistently professional and helpful. I think it highly depends where you are, I had 232 hotel days total in 2018, and you can not compare Europa, Asia or the US. In Europe. In Europe, I can tell you 95% if I will get an upgrade at SPG / Marriott or not. 19 trips to Frankfurt, the same hotel never got an upgrade there. Complaints got answered poorly and very rude. Since that we still use SPG / Marriott but switched Hotel brand and now every time an upgrade, very nice people. So you have to test a lot to get the satisfaction you want to have. So also very important who is managing the hotel locally and how they train their people. So not all are related to the change from SPG to Marriott. But because all is getting a bit out of line and tested past ten stays, IHG and Hilton are trying to match to check out what they have to offer or willing to offer. Loyalty is not that what it was 5-10 years ago. I have started to stay at some boutique hotels. Some of the options out there are surprisingly good. The price was 25% less than the local Marriott and Westin. I didnt know that mid level hotels have screens in every room and showers with steam and 7 shower heads. If these big boys don't get things together real quick, we are gonna see lots of new boutique hotel chains. It's never too late to take a chance on something new. No, Marriott's not always been this bad. Phone reps used to be pleasant and knowledgeable. Other than the occasional missing stay, nothing really negative to report. Hotels were pretty consistent and one of the reasons our office traditionally went with Marriott is that the product/experience was generally consistent. SPG's website was always friendlier and reliable (I miss the price grid), but Marriott's old site was decent and usable. 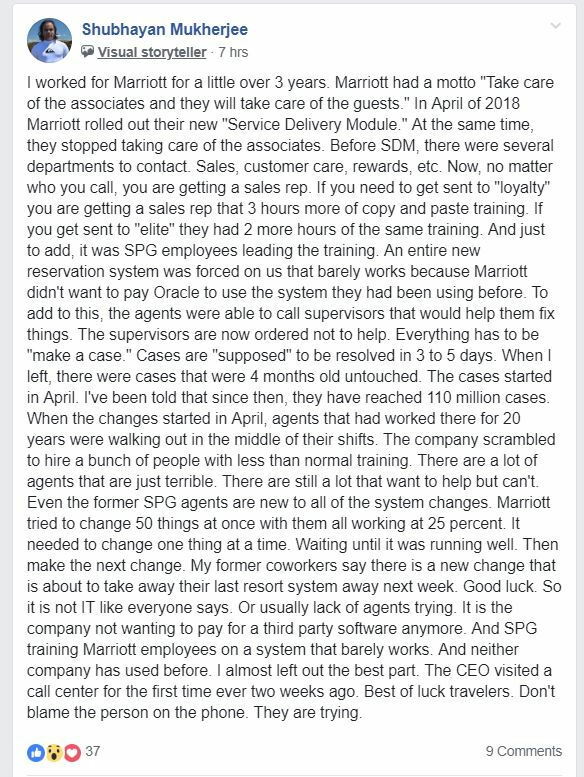 The former Marriott employee's post above just confirms what I've suspected -- Marriott is trying to do too many changes simultaneously and isn't waiting to get things right before proceeding with the next change. That includes me! Those guys represent a bygone era that unfortunately, parts of Marriott still clings to. I like to joke to my friends that Marriott is so out of touch that they will still put those portraits in the lobby of W's. PointWeasel and transportbiz are both wrong, even though it's inconvenient to their points. I've stayed over 2,000 nights in hotels, and was SPG gold or plat every year since the program's inception (and was Sheraton and Westin elite before that). Starwood was never great about consistency, either of the hotel product itself or delivery of the promised benefits. And when they fell short, they did NOTHING to correct the problem or the under-performing properties. For many, many years Marriott offered both a more consistent product, and a more consistently excellent guest experience. I have never claimed my experience is the same as everyone else's, but I often mention it to counter the unfounded blanket statements that somehow SPG delivered nirvana in lodging while Marriott was the equivalent of the gulag. Twickenham and NoviceFT like this. You’re just swiming upstream. At this point the well established narrative on this forum is that SPG was an absolutely idyllic program where everything was just marvellous and everyone was happy. SPG associates were just like family and its properties were just agreable as home. Deviating from this narrative is anathema. C17PSGR, DJ_Iceman, writerguyfl and 2 others like this. Stayed at a Sheraton and it's definitely not anything like a Marriott. The LM in Kuala Lumpur was great. However the new Tribute Portfolio in Germany is meh, no heat in the room when we there there in in December (new hotel by the way). Did SPG BRG once and I got a good impression of it - didn't get more chance to try unfortunately. I was talking to a AFOM in a Marriott in Asia and we talked about the merger, he said "the worst about the customer service is from Starwood side". He has been a Marriott guy for a long time and I told him that I heard the exact opposite. I also told him how fed up I'm with the post-Merger Customer service and he said it is caused by *w staff. It doesn't matter as they are all Marriott staff now.